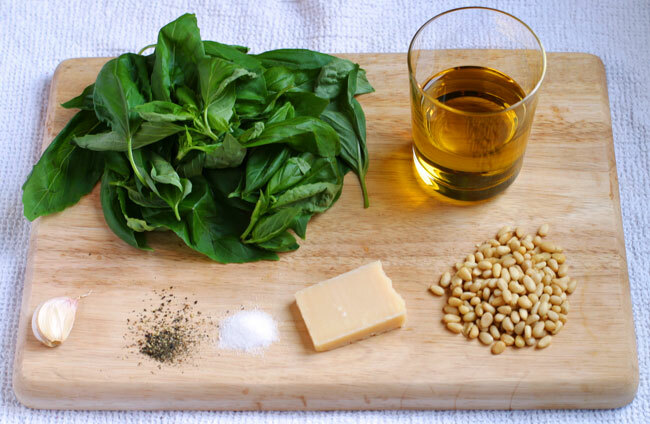 This is a classic pesto recipe using fresh basil and toasted pine nuts. I like to add a dash of lemon juice for a bit of a zing. This is super quick and easy to make in a food processor but it can be made using pestle and mortar. Toast the pine nuts in a pan for a few minutes until they get fragrant and slightly coloured, this should take a couple of minutes. Put in a bowl to cool and stop the toasting process. Put the basil in the food processor. Add roughly chopped garlic clove. Pulse until everything is finely chopped. Grate the cheese and add to the the food processor along with the pine nuts. Serve mixed with pasta and some grated cheese on top. Baru, to je moc pěkný! Čerstvý pesto miluju, Lukáš ho občas dělá a od té doby co jsem ho ochutnala tak už to ze skleničky nemůžu jíst :) Fotíš to sama? Dekuju moc :) A ano fotim sama starsi digitalni zrcadlovkou.